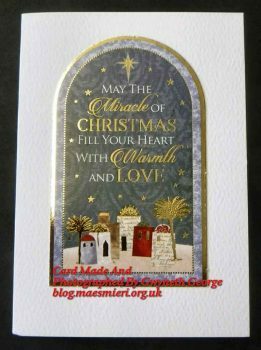 By the time I am writing this post I have so many Christmas card photos on my camera I’m not even sure if I’ve shown you these already or not. 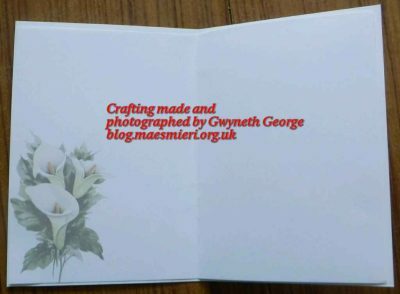 I don’t think I have, but please forgive me if some from a previous post have sneaked in to this batch. 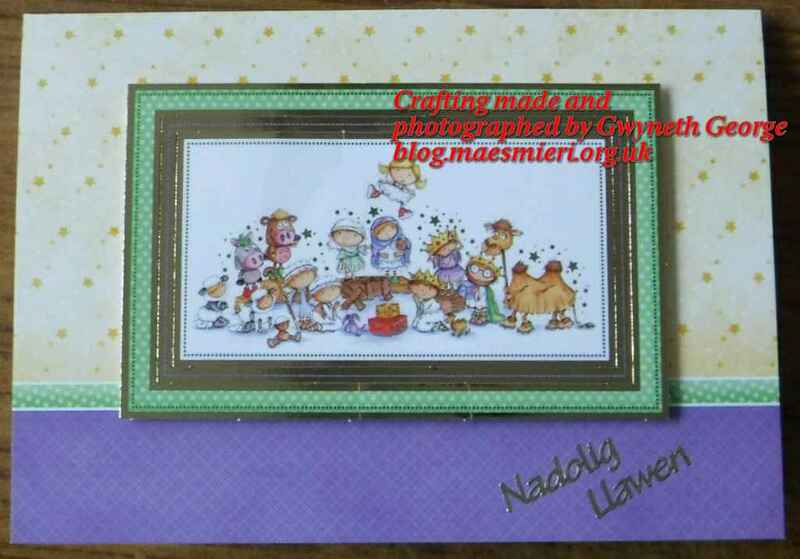 These are all made using items from the Hunkydory collection with some extra cardstock, banners, etc. 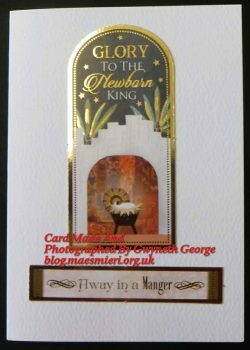 Rather than directly sticking the toppers to the base cards I have used some 2mm or 3mm deep foam tape to attach this time. It gives a little dimension, so will need a Large Letter stamp to post in the UK, but are great for hand delivery. 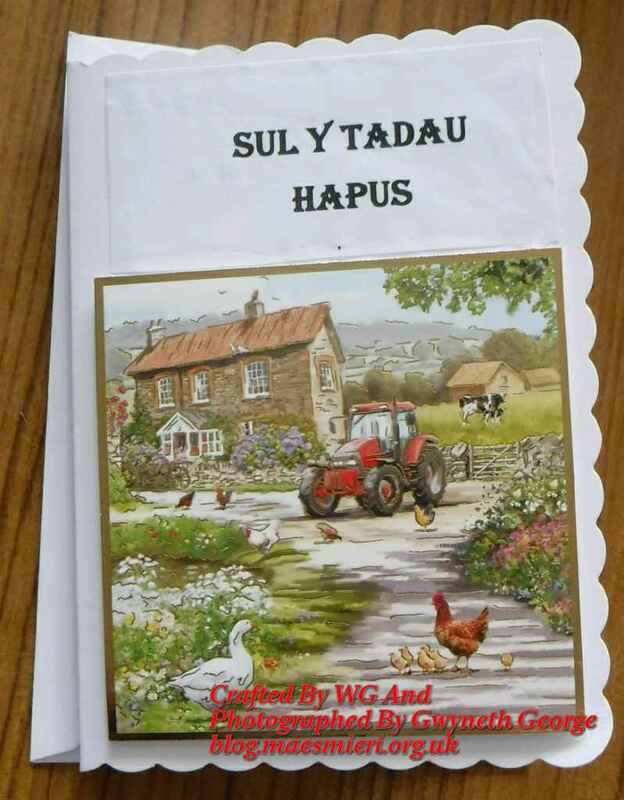 All have an insert that says Nadolig Llawen a Blwyddyn Newydd Dda (Happy Christmas and a Good New Year) on the inside. 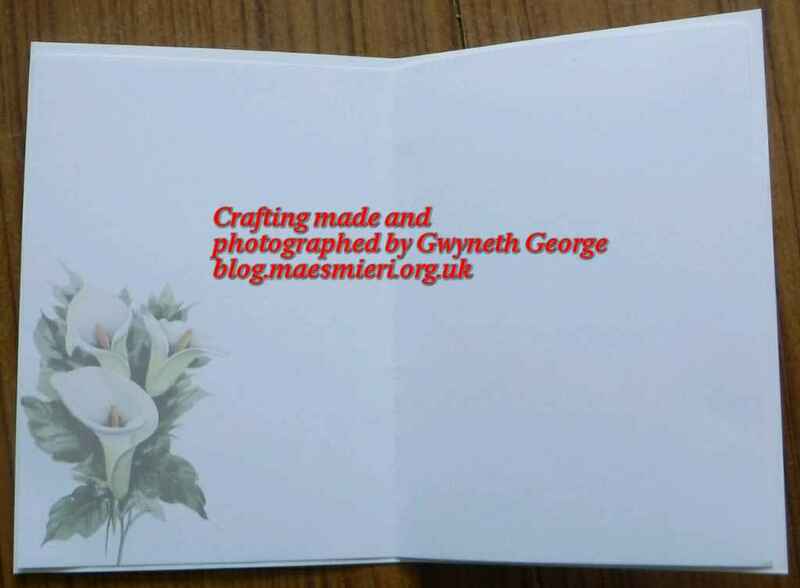 Trying to get a photo to show some of the dimension of the previous card. 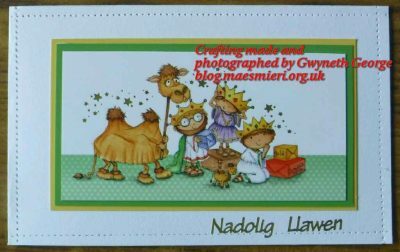 If I remember rightly, these have gone into a big bag of assorted Welsh cards where people can have a look through and select individual cards. 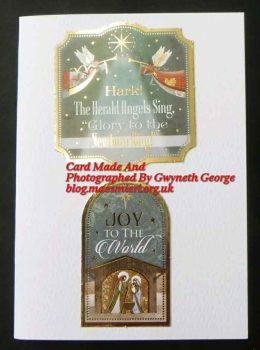 I’ll do have a small number more of Christmas card posts to come over the next few days, but I have now re-started on my sewing projects, so expect updates on how my Big Work In Progress is coming along in the near future as well. 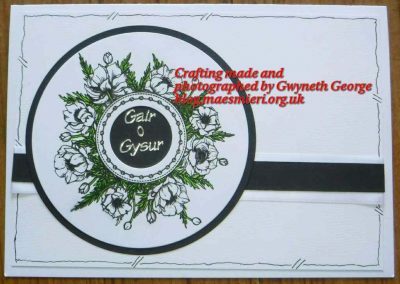 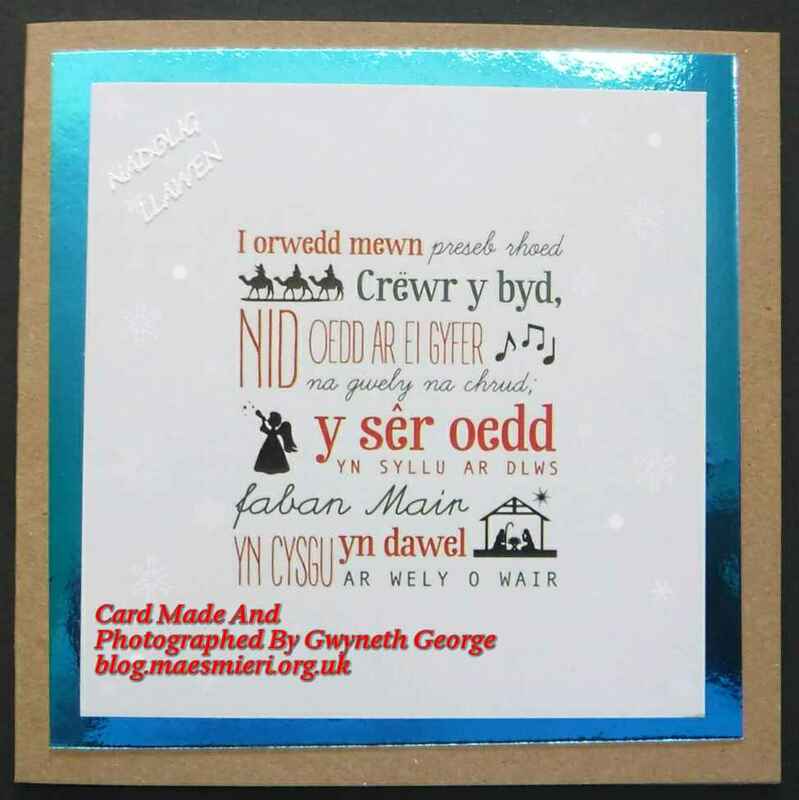 Anybody who’s visited my blog before will probably have noticed that the vast majority of my cards are in Welsh. 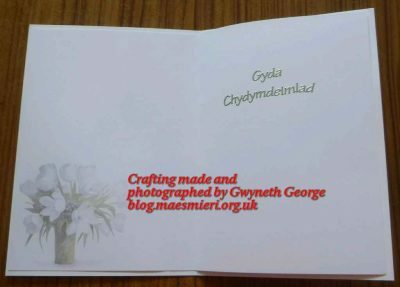 I do however make a small number in English, mostly when specifically asked for them. 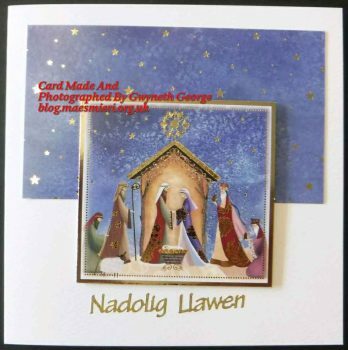 To be ready when asked, rather than making after being asked, this year I decided to make a few assorted English Christmas cards and put them in a big plastic bag where anybody can choose 1 for £1 or 6 for £5. 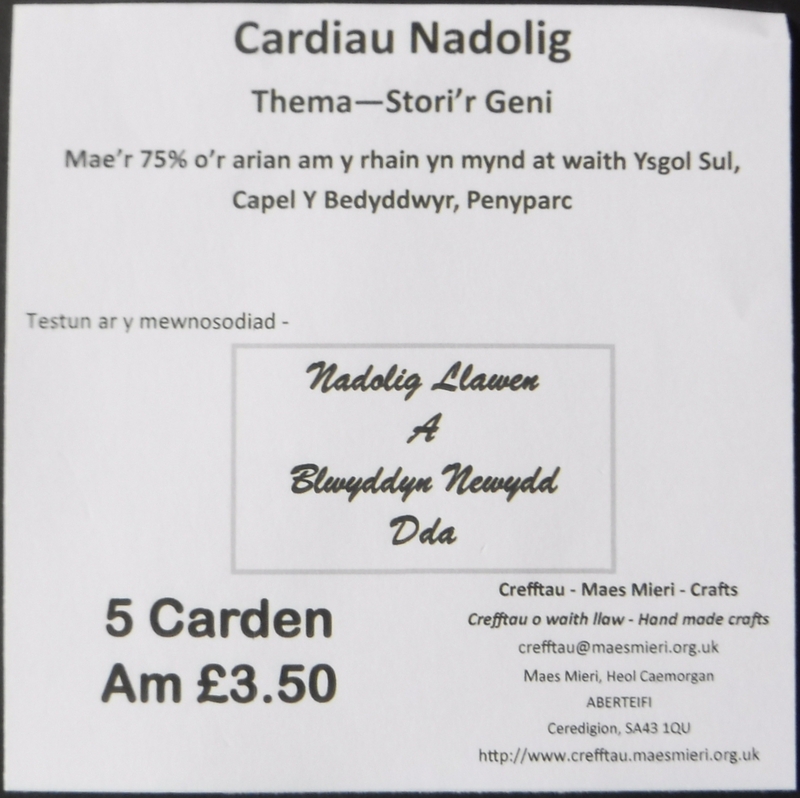 Again I’m donating a percentage of any money made to our Sunday School. 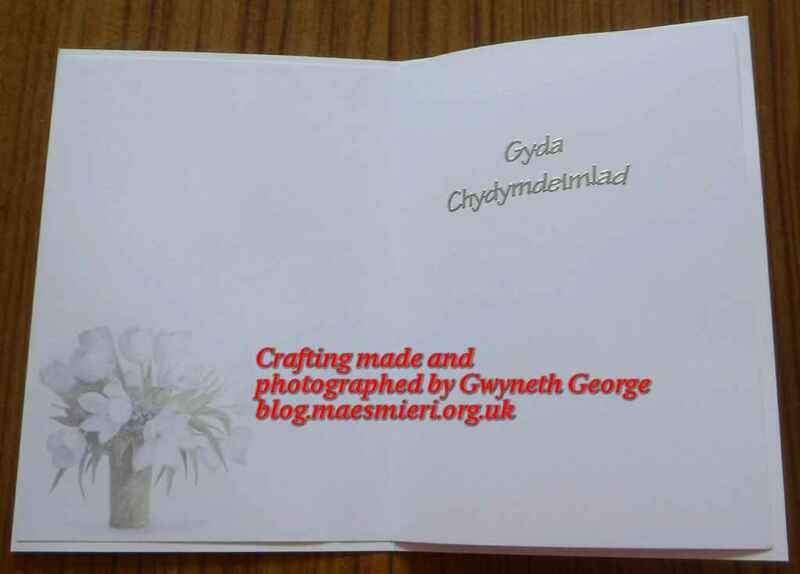 I’ve not made a lot to fill the bag yet, but here are the first few. 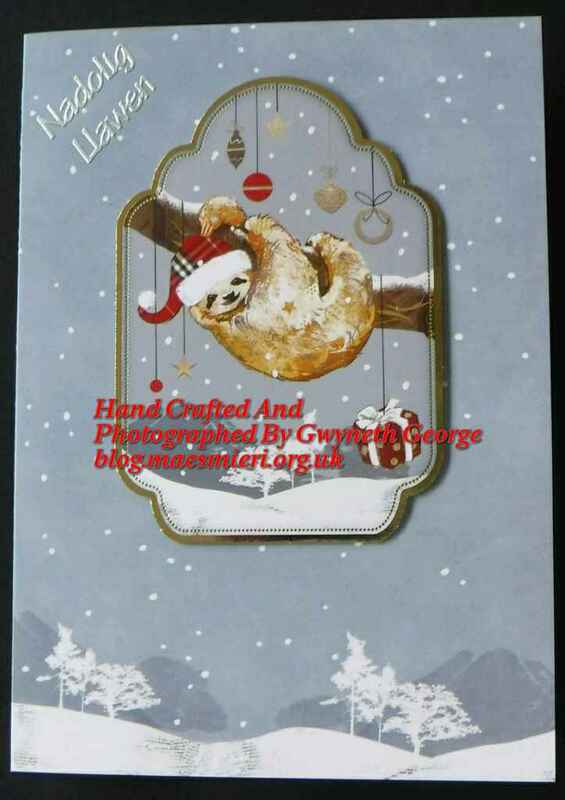 Made using items from this year’s Hunkydory Christmas collection. 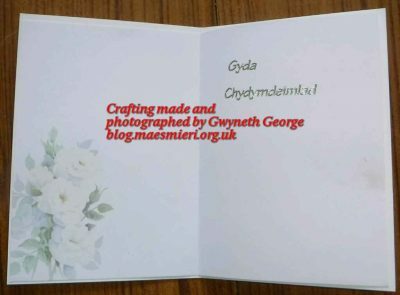 It has a greeting added to the inside as well. 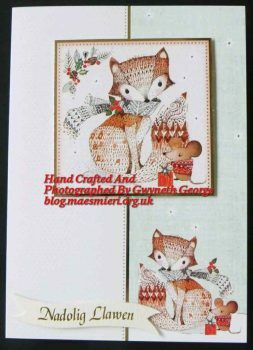 The next two were made using the same Peter Rabbit topper from my box of old Christmas stash, and therefore look very similar. 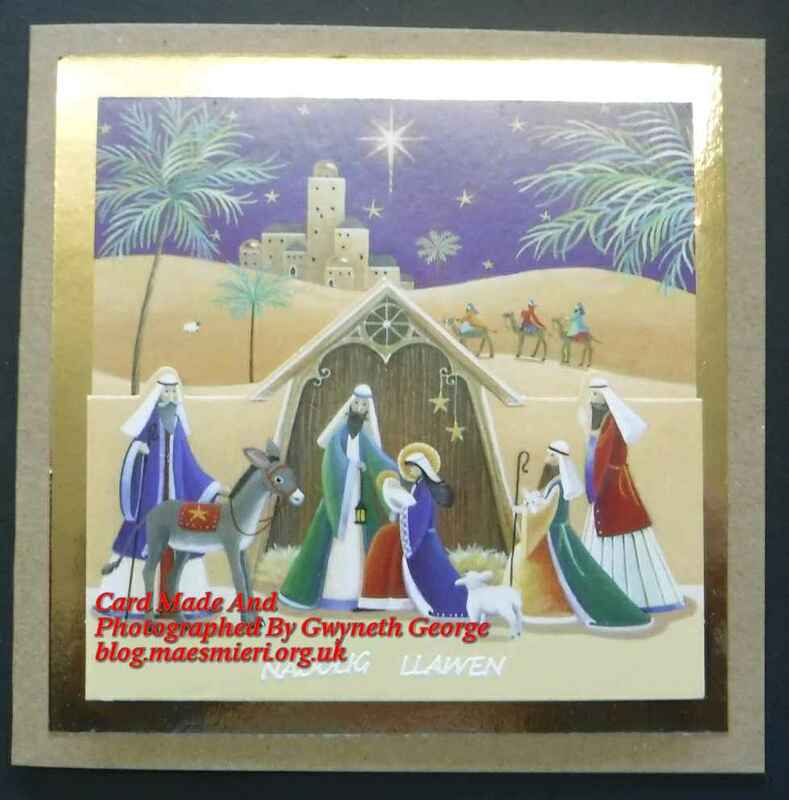 I therefore made them slightly different by adding holly peeloffs, to the corners of the topper on one and the corner of the foiled background on the other. 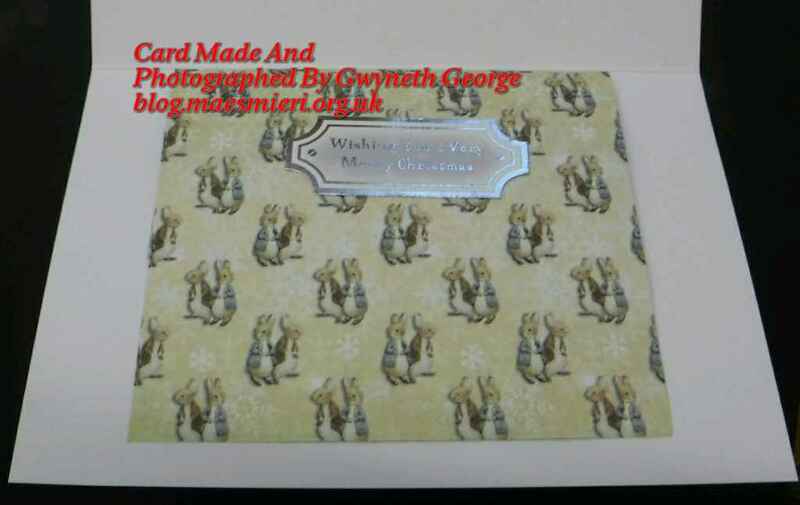 Both had small inserts added which were made using different Peter Rabit backgrounds. 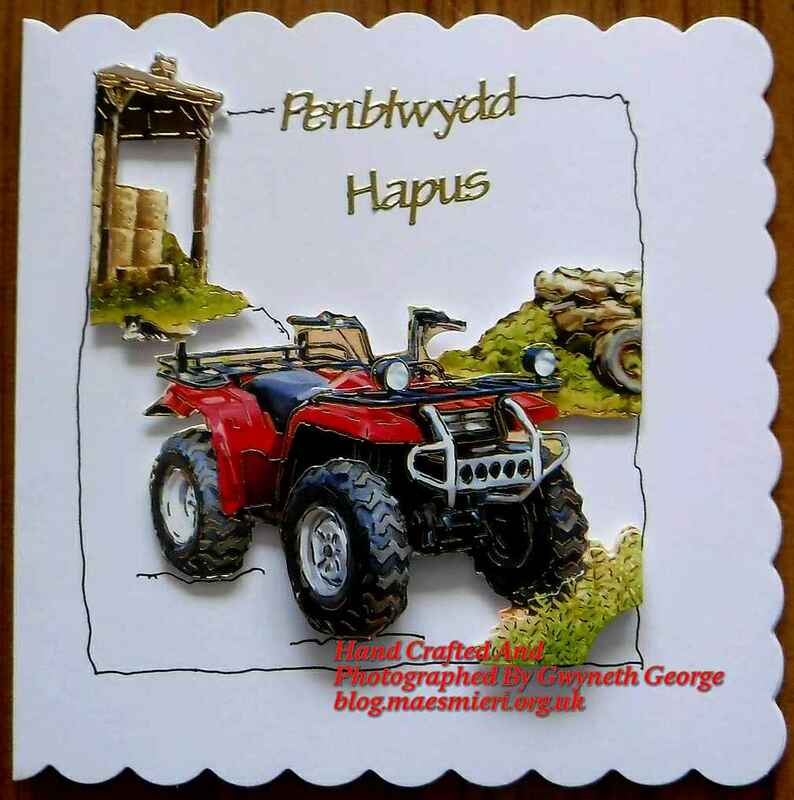 The next three cards are again made using Hunkydory toppers. 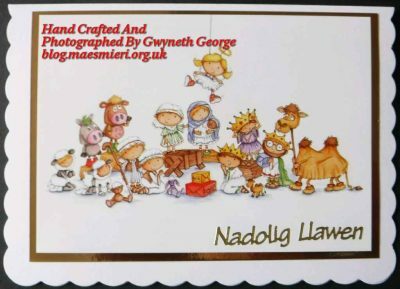 Not sure whether they are from this year’s collection or leftovers from previous years that were in my box of Christmas “makings” that was out the garage. 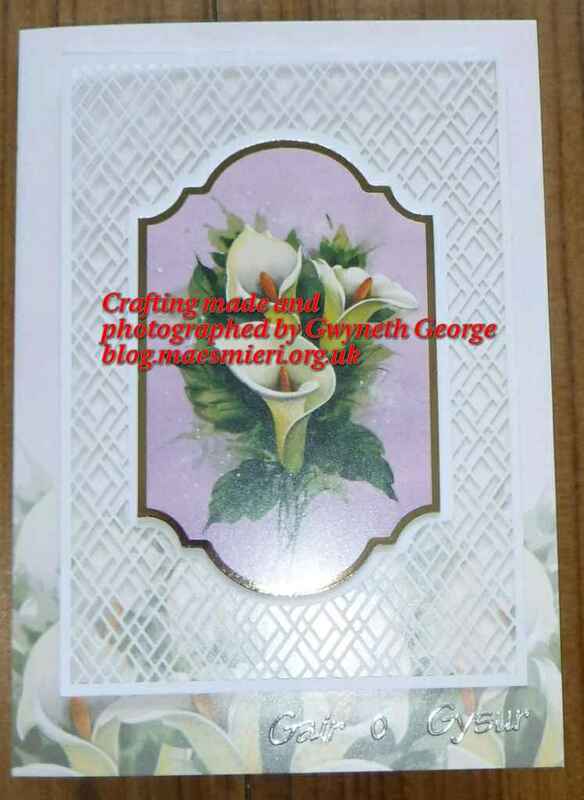 These I have kept very simple, thus keeping the cost and dimensions dkwn. 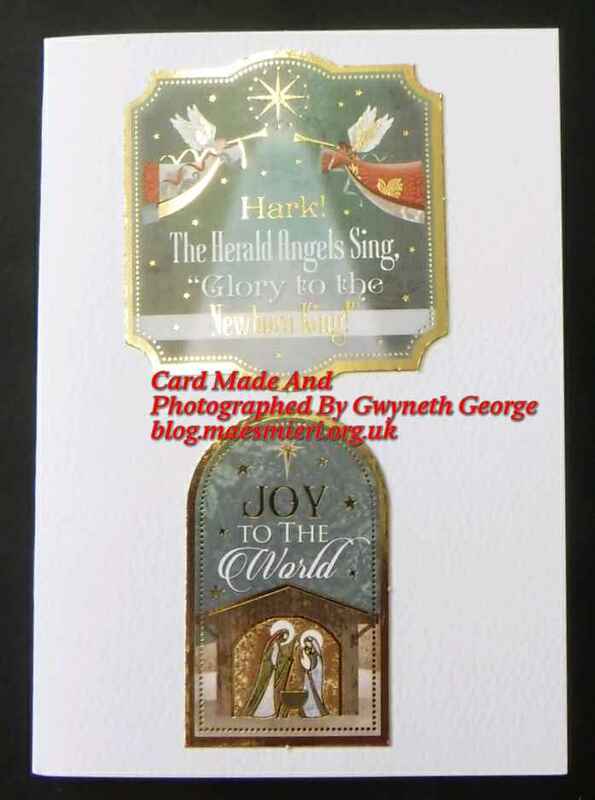 I’ve just stuck on toppers onto a scored and folded, hammered, cardstock of a suitable size. 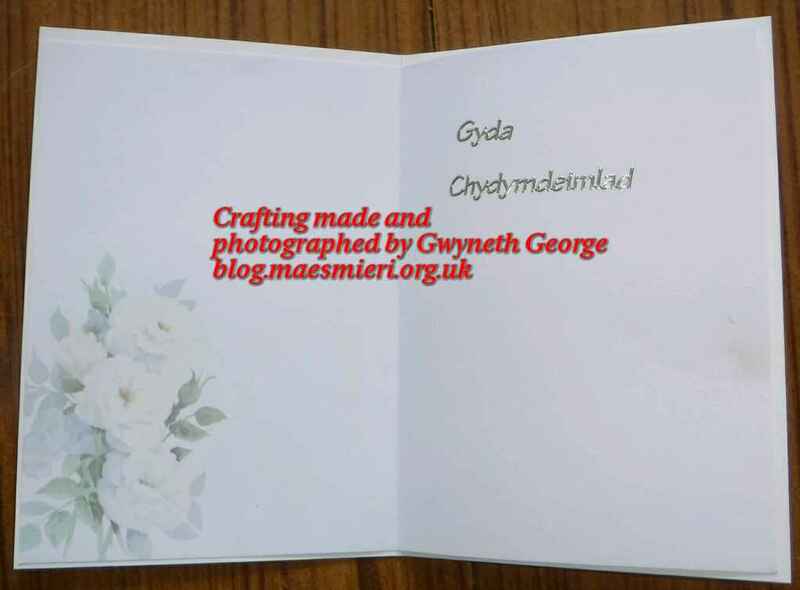 So that’s it for this blog post. 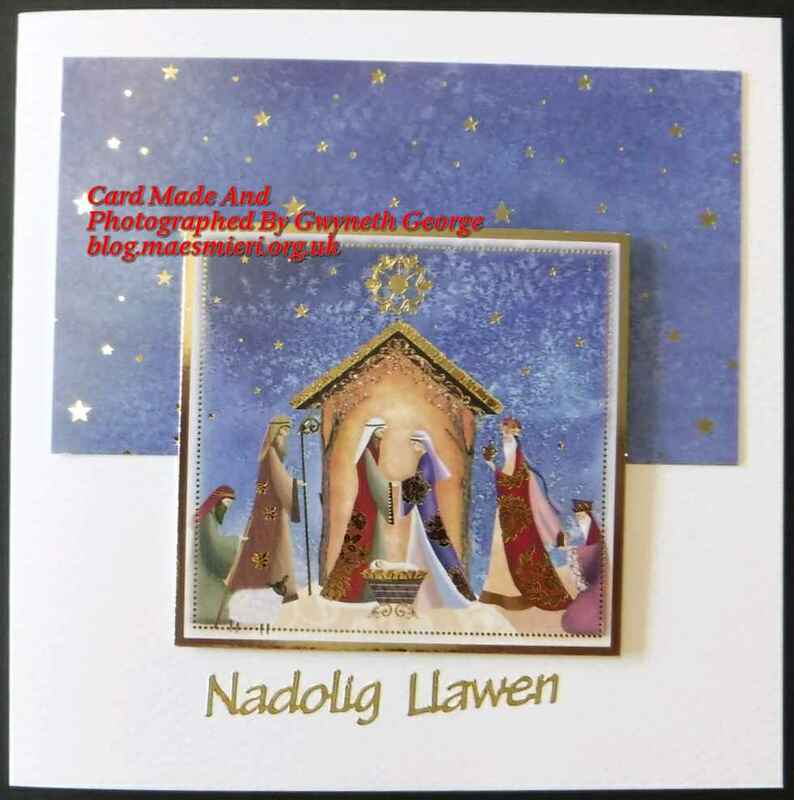 I’ll have some more Christmas card, both Welsh and English, to show you over the next few weeks, so please do pop back to have a look. I’ve been going through a big batch of old Christmas cards that I’d got put away in my box of Christmas Card makings after cutting off the backs. 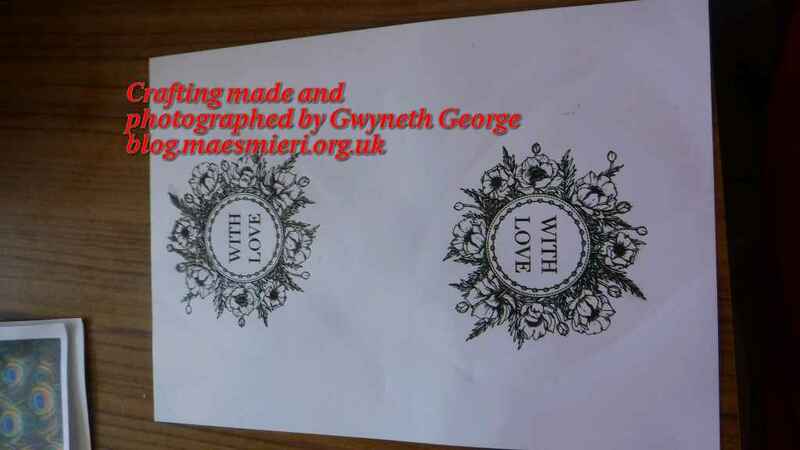 I started by triming any that needed trimming to around the same size, then matting and layering each image. 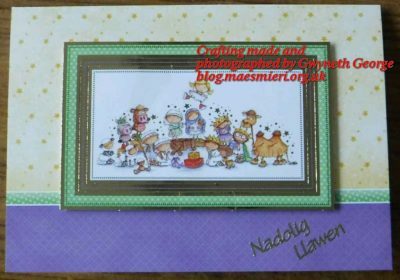 I then took a pack of pre-scored, kraft card base cards and used double sided tape to attach my matted images to the card fronts. 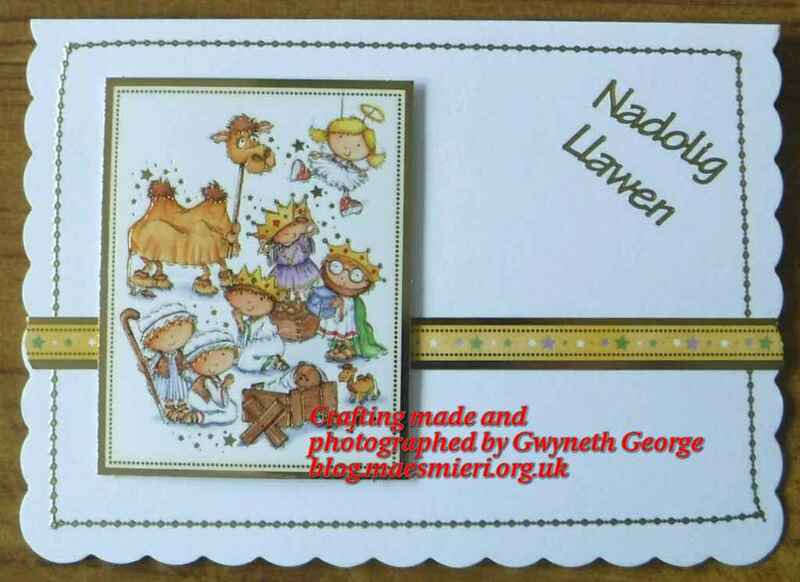 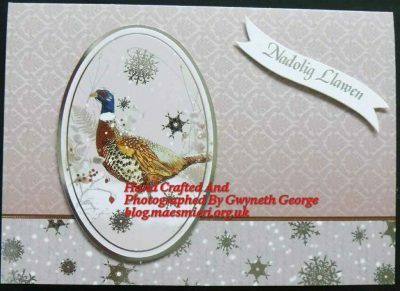 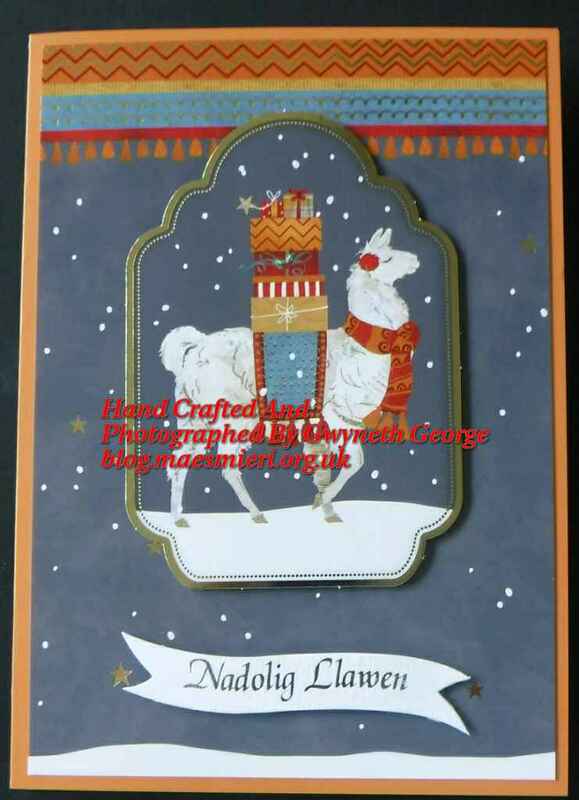 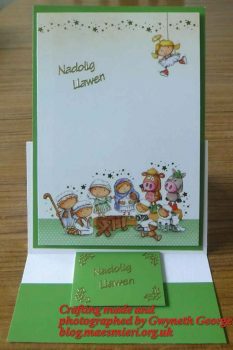 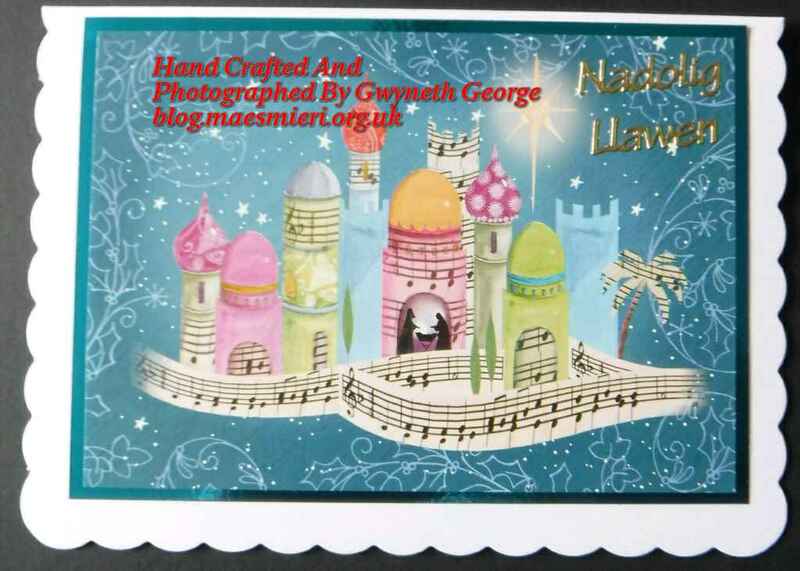 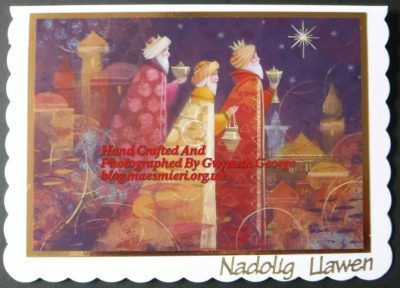 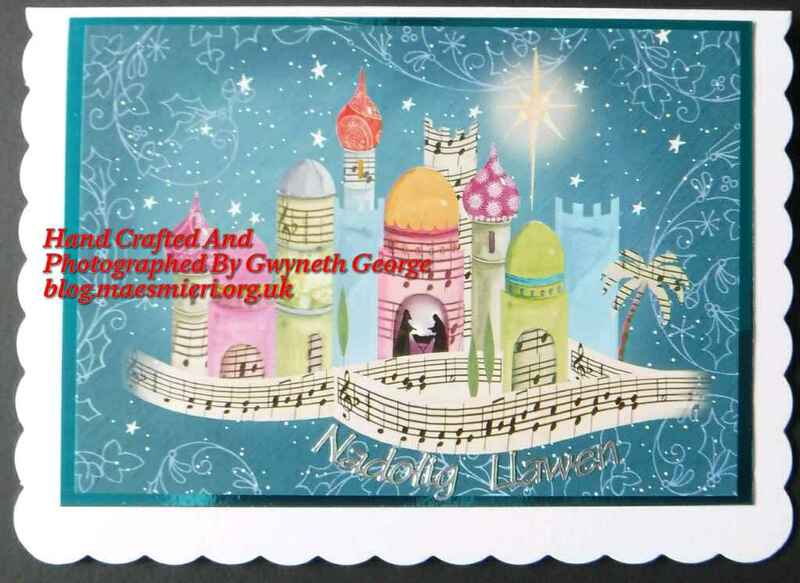 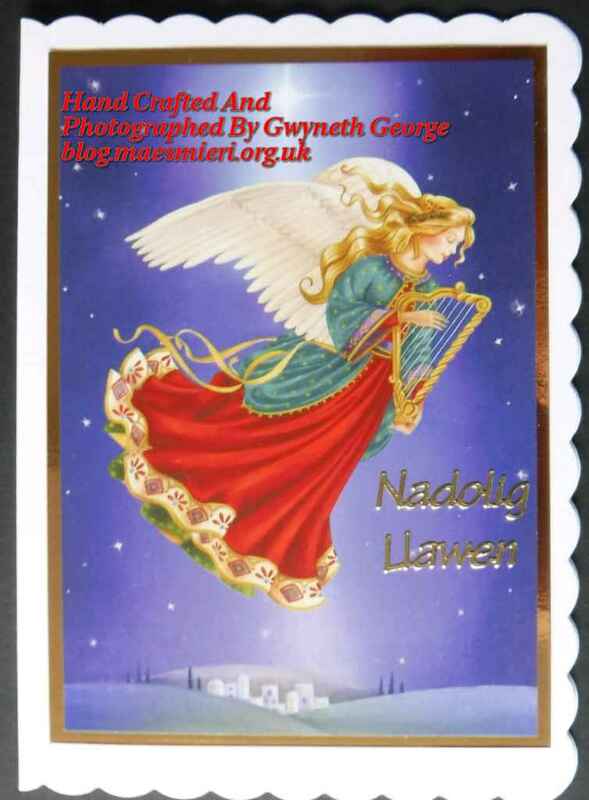 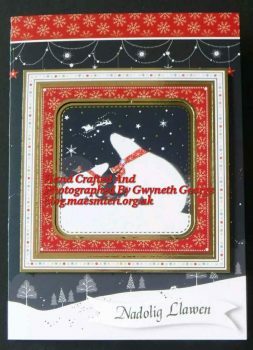 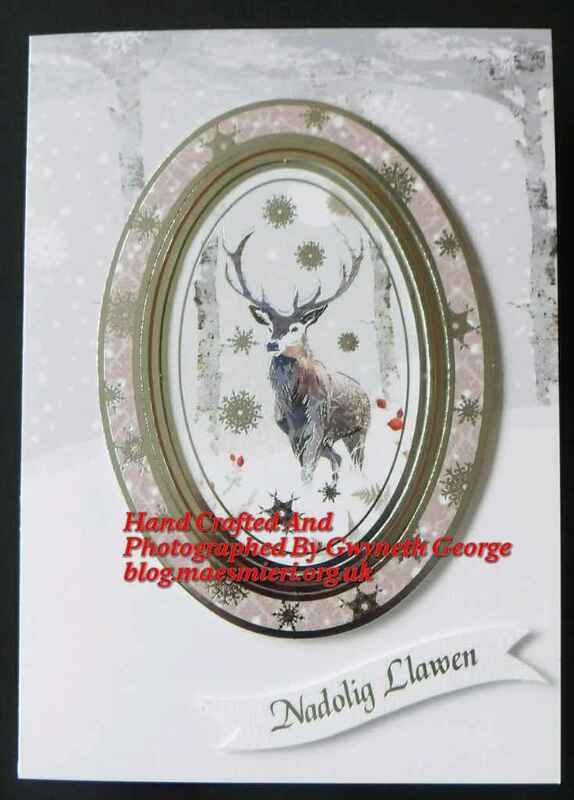 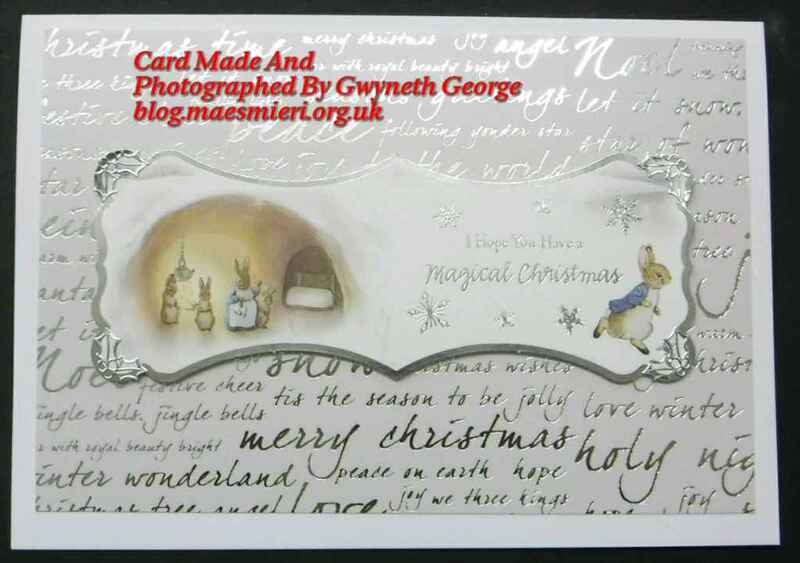 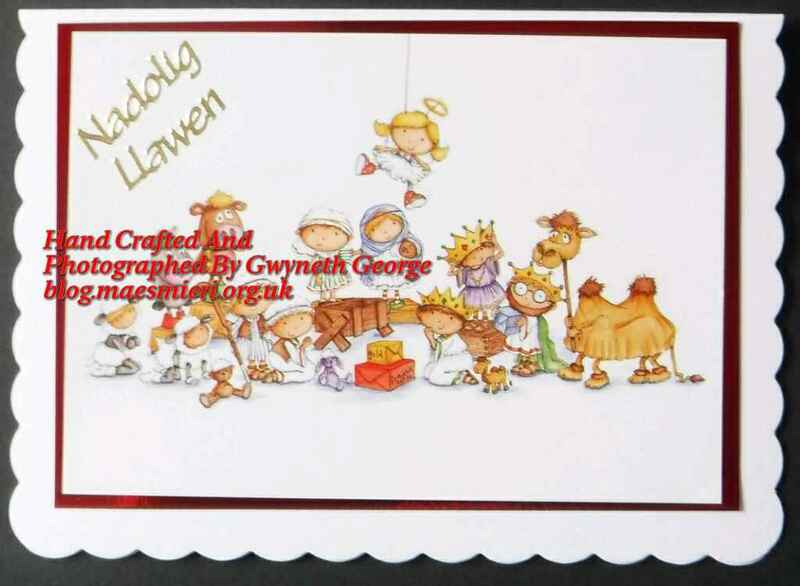 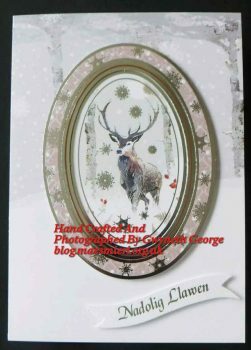 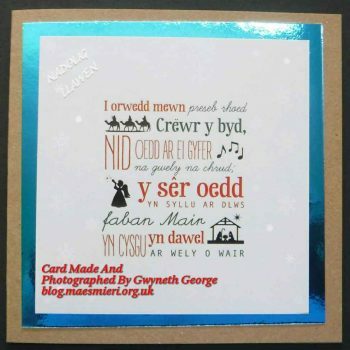 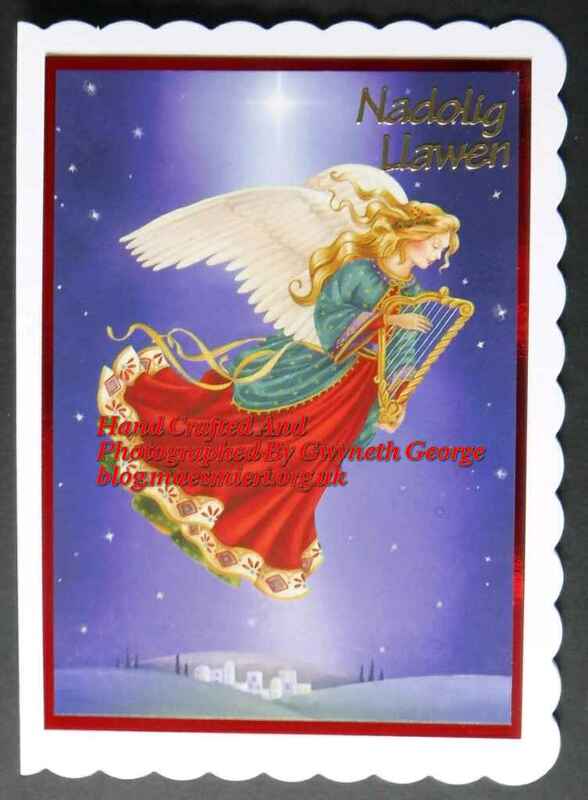 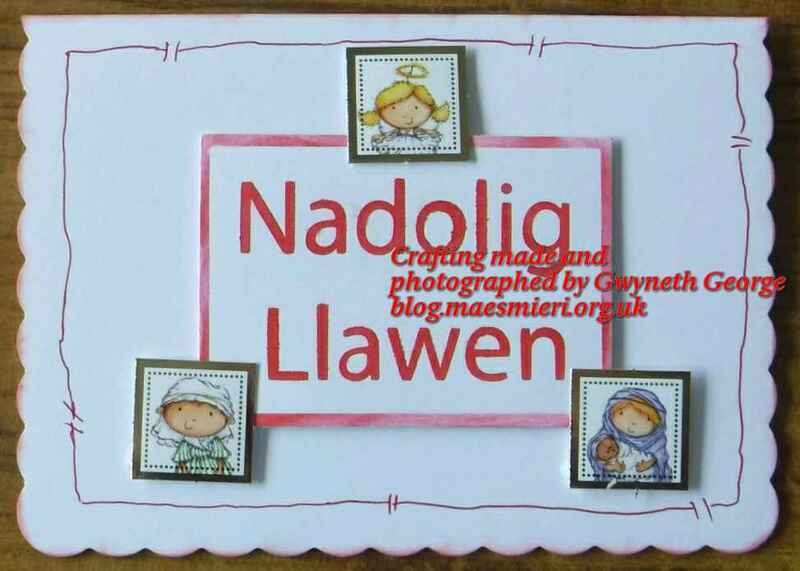 I used peeloff “Nadolig Llawen” greetings (Welsh for Happy Christmas) on the card fronts. 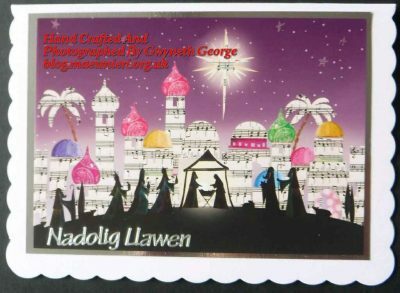 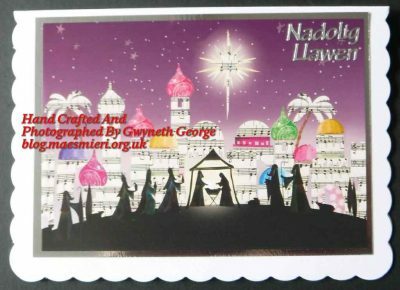 And an insert with “Nadolig Llawen a Blwyddyn Newydd Dda” (Welsh equivelent for Happy Christmas and a Good New Year) on the inside. This is the second card with this image. 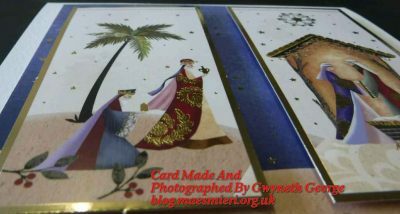 It’s amazing how many cards with the same images on are amongst the cards I’ve got in my stash to recycle. 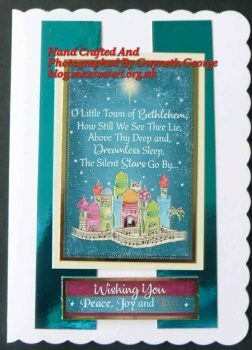 So, that’s it for today – another assortment of recycled quick and simple cards that are small and flat enough to go throught the UK post using a standard size stamp. 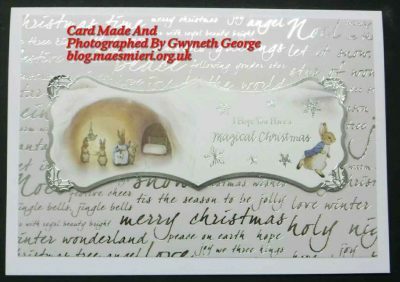 I’m on a Christmas card roll at the moment so I’ll have some more Christmas card posts to put online over the next few weeks, so please do pop back to have a look. 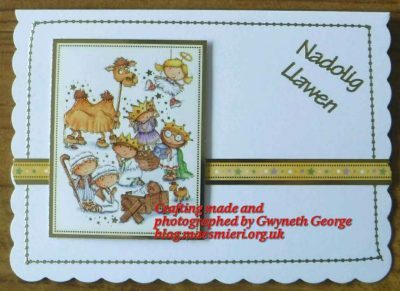 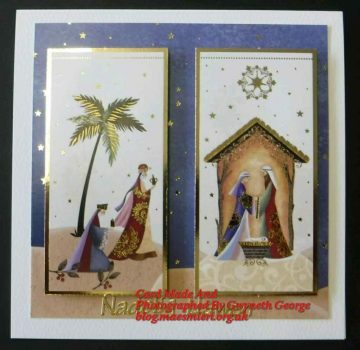 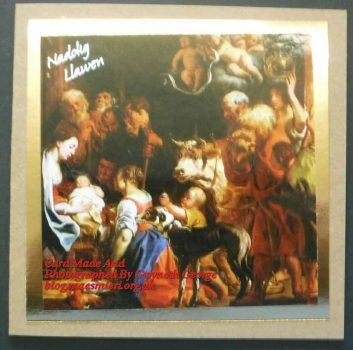 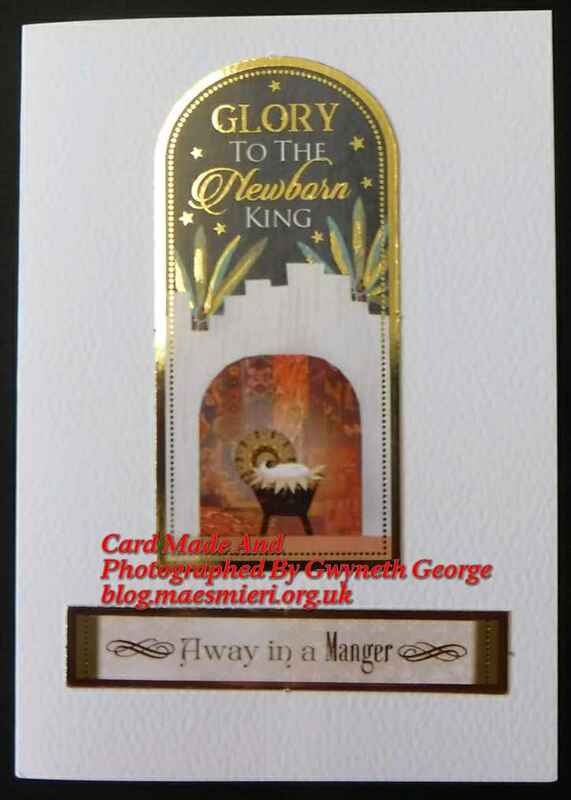 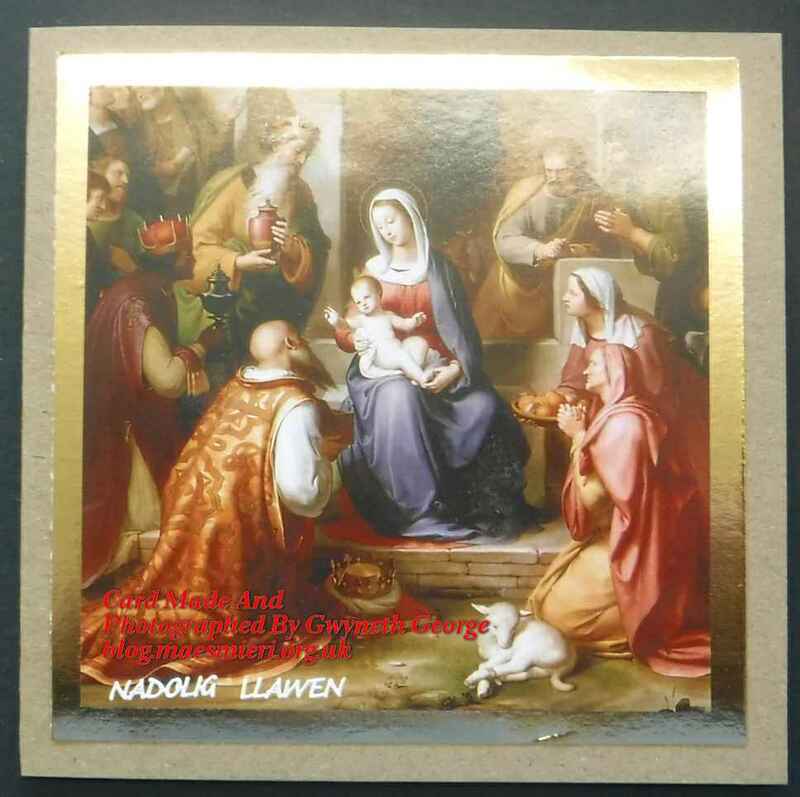 For the cards I’m going to show you today I picked out images which had a bit of the Nativity scene on them from a Hunkydory little book. 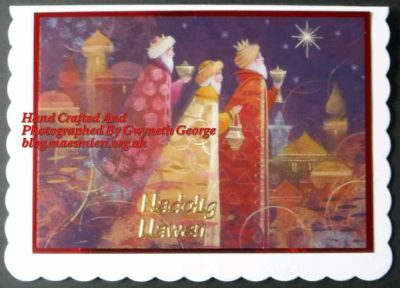 There were five images chosen, and six of each. 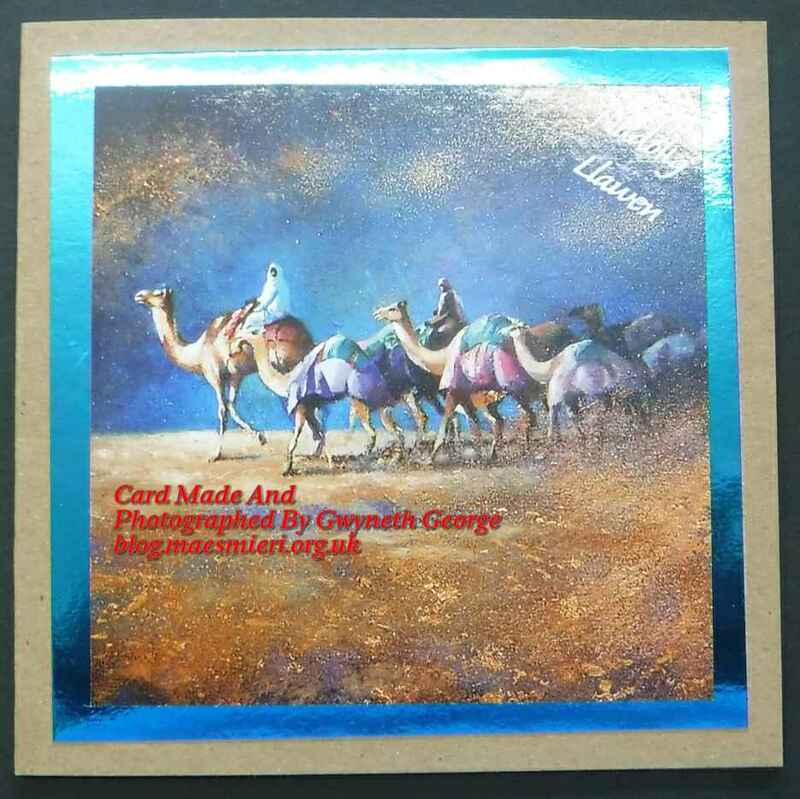 I started by matting and layering each image with a metalic mat of either gold, silver, or red mirror card. 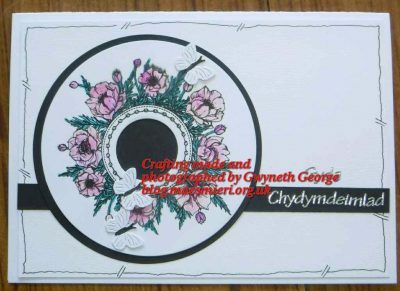 I wasn’t wanting every of the same image looking exactly the same so deliberately chose at least two different coloured mats for the same image. 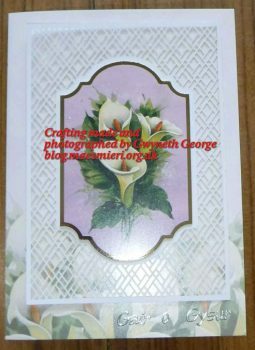 I then took a pack of pre-scored, scalloped, white base cards and used 2mm deep, double sided, foam tape, to attach my matted images to the card fronts. 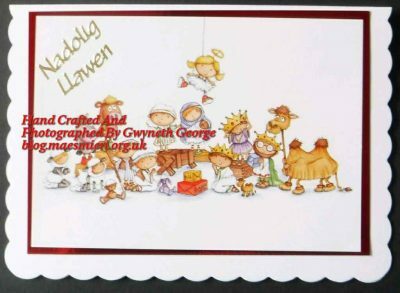 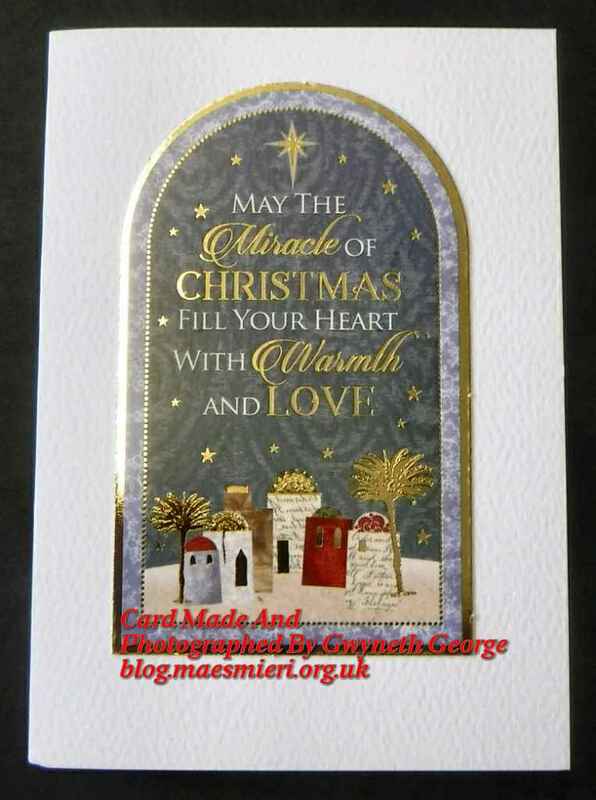 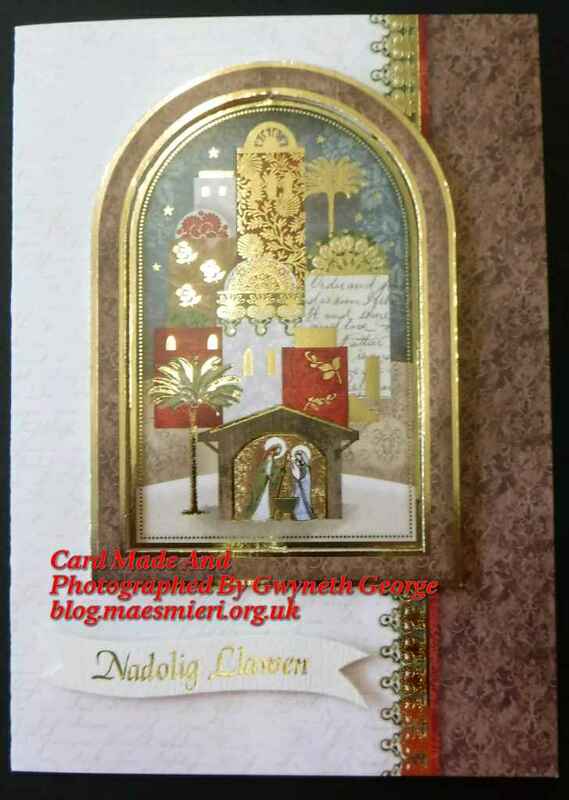 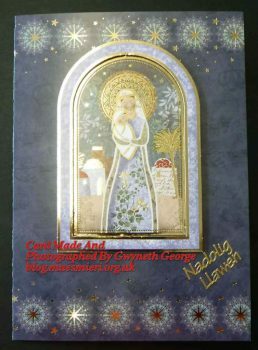 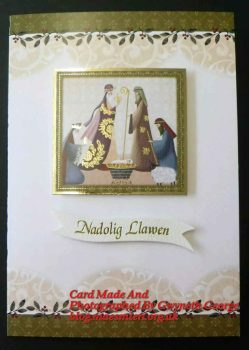 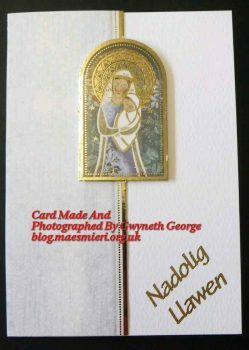 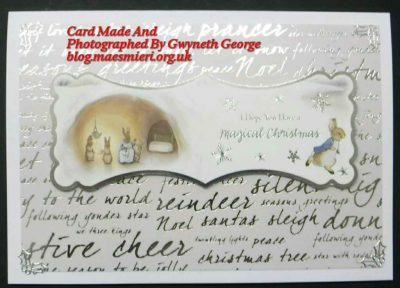 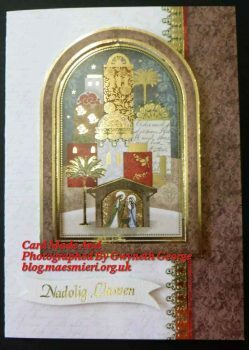 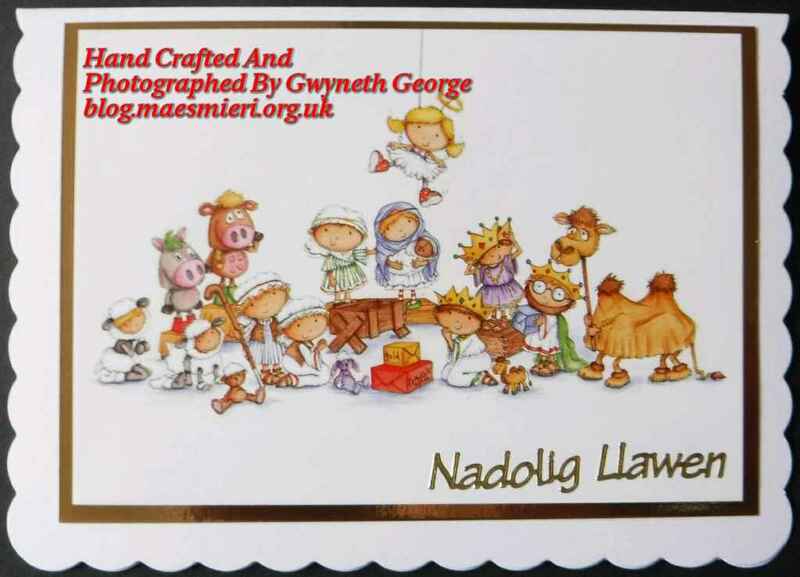 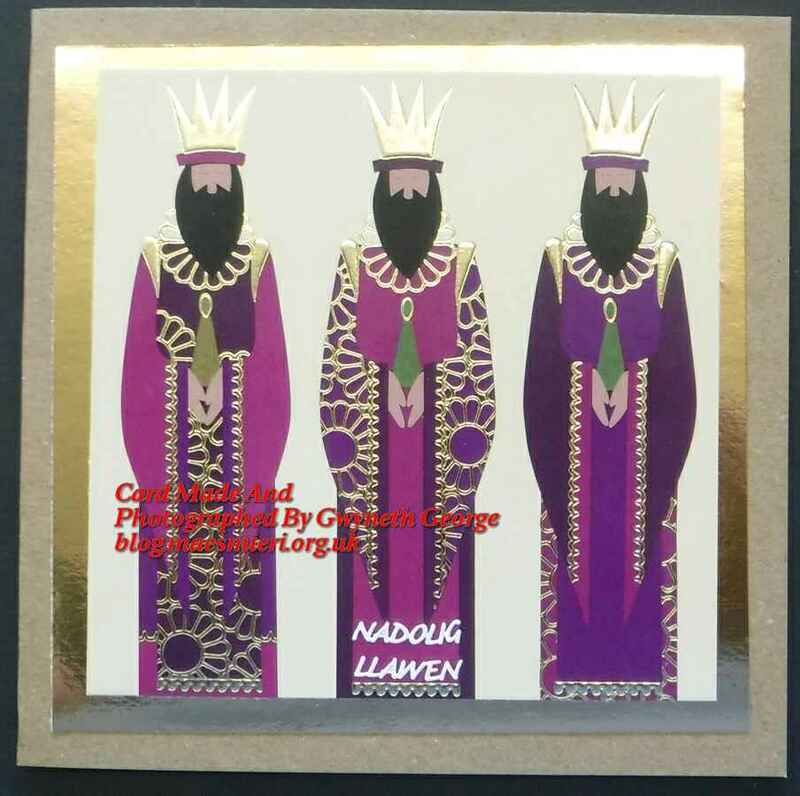 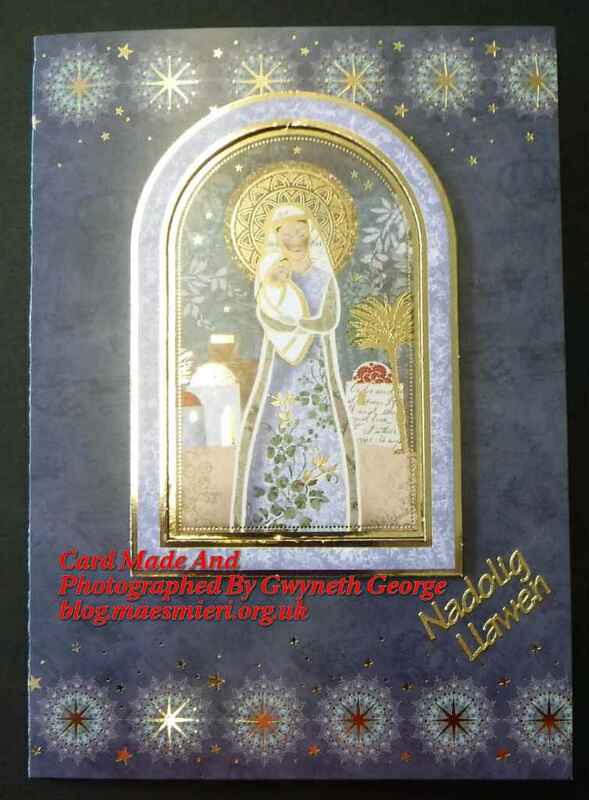 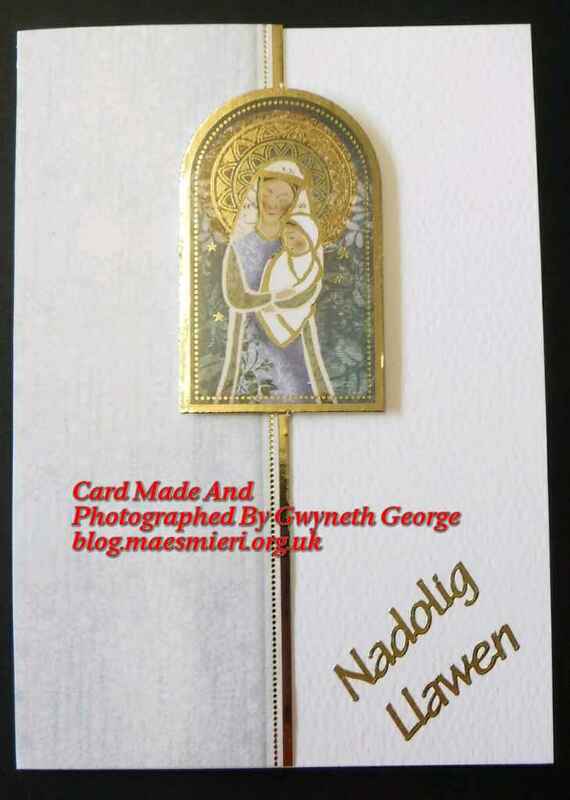 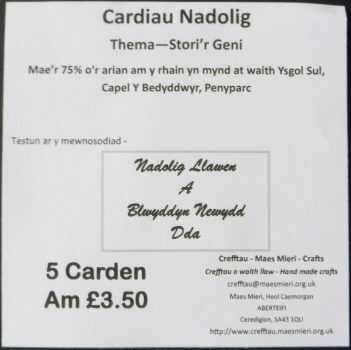 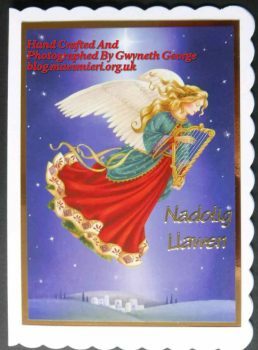 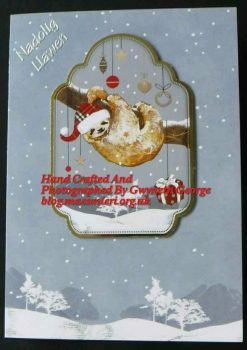 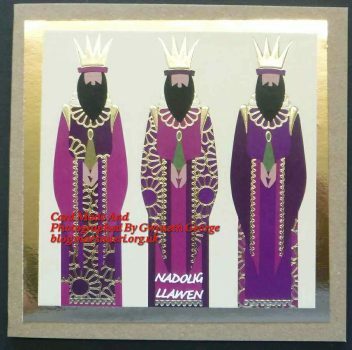 I used peeloff “Nadolig Llawen” greetings (Welsh for Happy Christmas) and randomly used gold and silver ones, placed at different locations on the card fronts, to make each card with the same image slightly different. 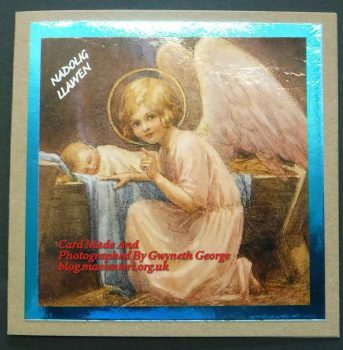 These cards I batched into 6 packs of 5 cards each with envelopes and the following label put inside before sealing the cello bags. 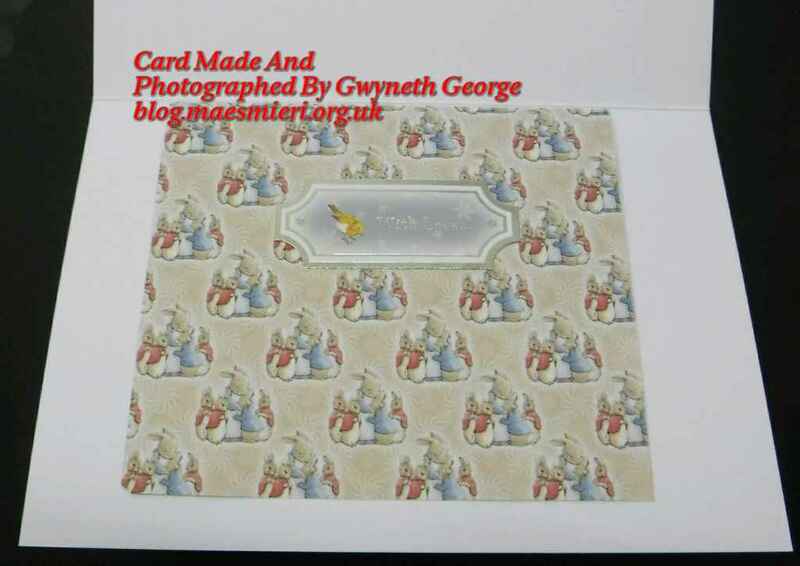 I’m not going to post photos of all 30 cards, but here are the contents of one pack. 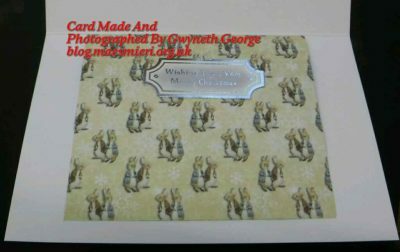 And here are a small number of the rest, one of each image taken at random from the different packs, so you can see the difference in greeting location and matting colour. 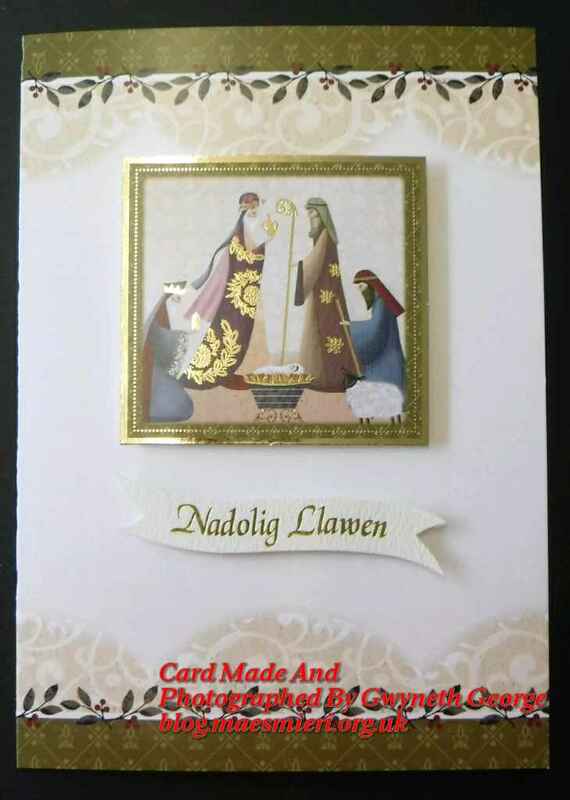 So, that’s it for today – quick and simple cards. 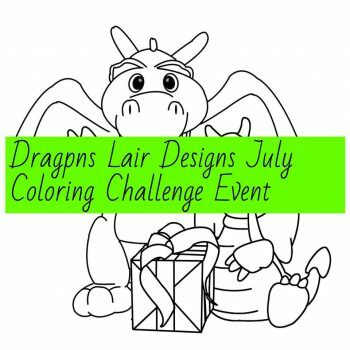 With so many members of the Dragons Lair Designs Fan Group on Facebook having less time for crafting over the busy summer months it was decided to run the latest colouring challenge over two months, rather than one month, to give those who wanted to take part more time to request the free digital stamp, create something with it, and upload a photo of their creation. 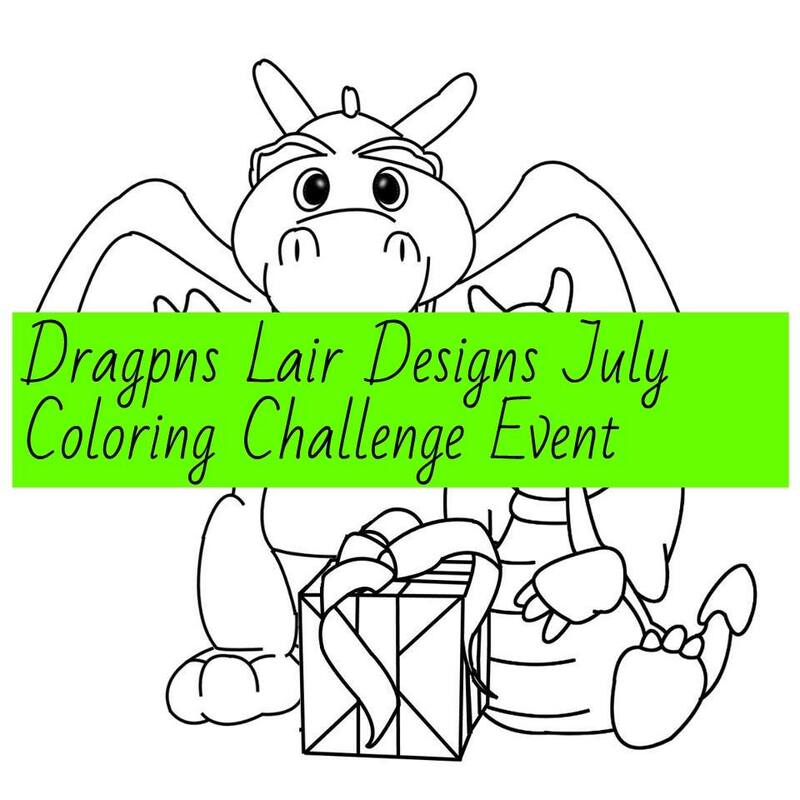 For the June/July colouring challenge the image group members can request for free is this one. Just join the DLD Fan Group on Facebook to get the image and join in. This time I coloured in the image using Chameleon Pencils. 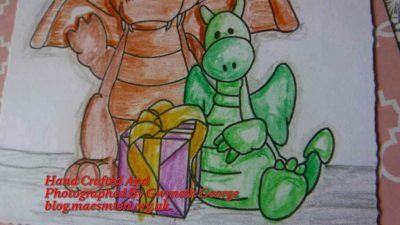 I don’t usually use coloured pencils and don’t think I got as good a result with these as I get with alcohol markers, but I will practice a bit more to see what effects I can get. To make my simple card I took a pre cut, scalloped edge, base card, and, just to show that DLD images can be mixed and matched with anything in a person’s crafting stash, I cut some background papers from the “Blooming Lovely” 8″ square paper pad by The Paper Boutique. I only used fingerlift tape to attach the various layers, to keep the card as flat as possible, and set things at a “jaunty angle”. 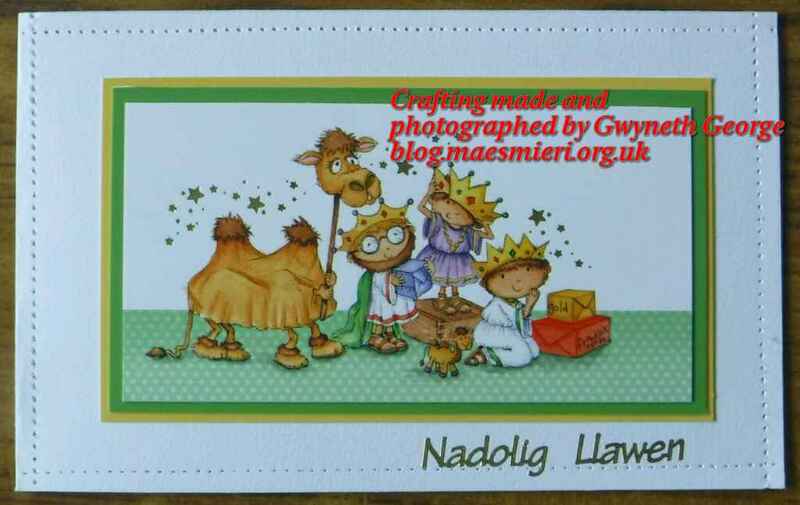 That’s it for today. 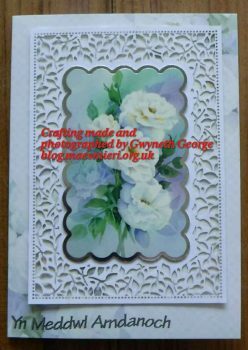 I hope to have another post on my blog to show you some more crafting before the end of the week, so please do pop in for a look again. 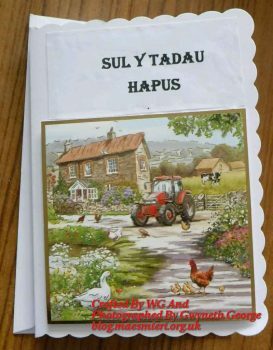 As my father died last year I had nobody to make a Father’s Day card for this year. However, one of my nephews did want to make a card for his father so needed some suitable material put out on the kitchen table for him to choose from. 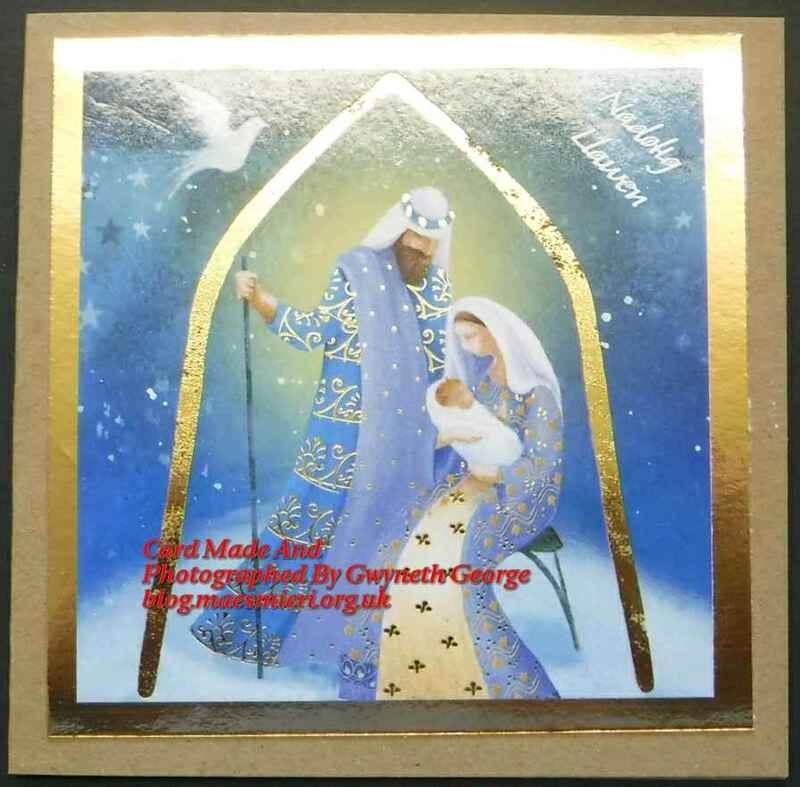 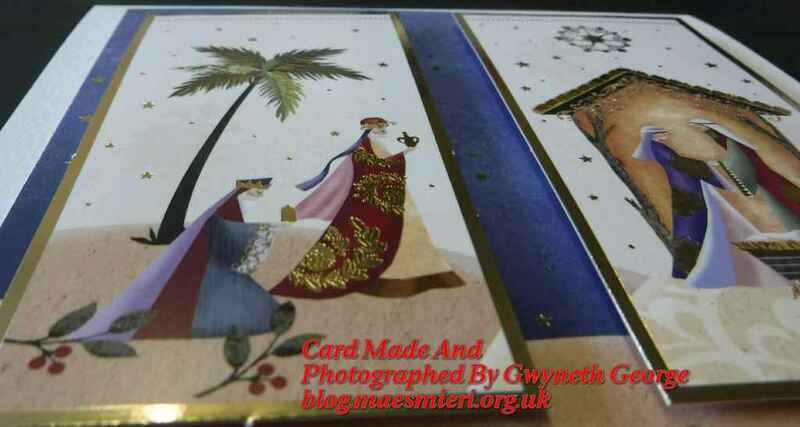 He was so keen to make an extra special card, and couldn’t decide between two images, that he put one topper on the front and one on the back – which meant that his father could choose which image to display, or even turn it around periodically to display a different side. Unfortunately I forgot to take a photo of both sides, but here’s the side I did photograph. I do know that both the toppers were Hunkydory, and I think they came from the spring decolarge collection, though my nephew decided not to decoupage either image on his card. 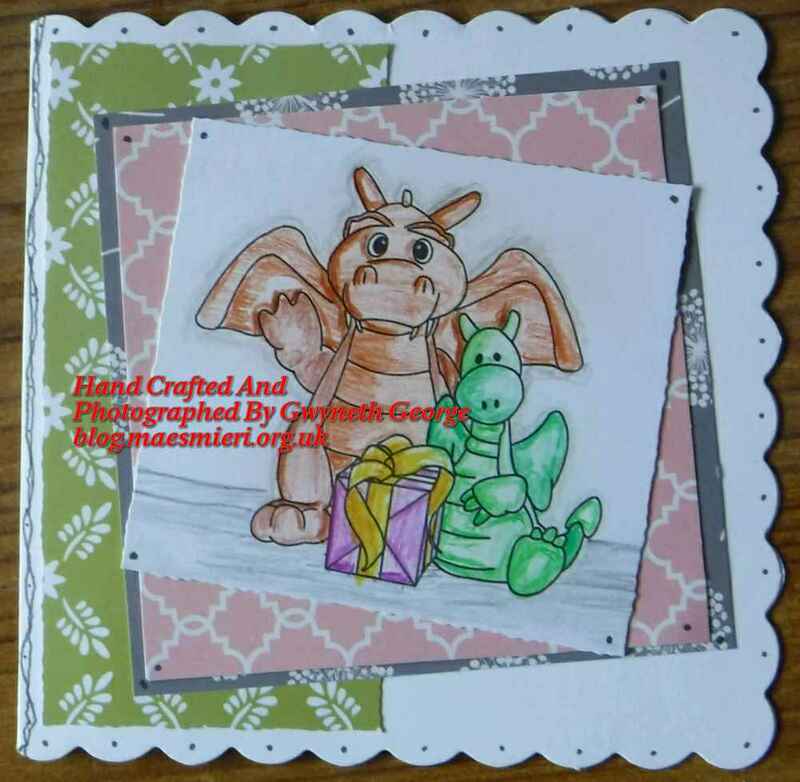 Which of course meant that the extra layers were available for me to make cards with while waiting for him to finish his creation. 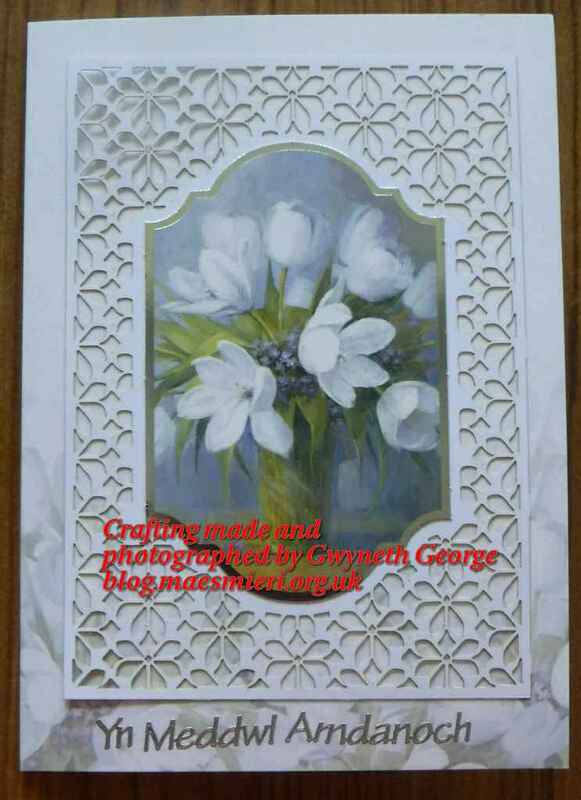 My brother’s birthday was before the end of June so I thought it would be a good idea for me to take the opportunity, while lots of cardmaking stuff was out, to make cards for me and our mother to give my brother. 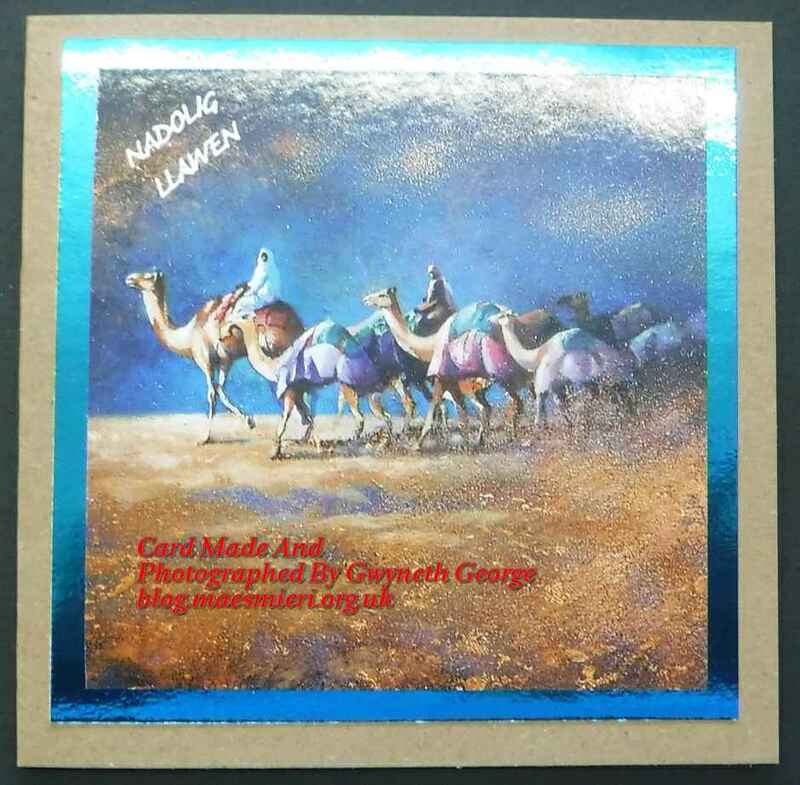 And for one I used the layers my nephew had decided not to put on his Father’s Day card. 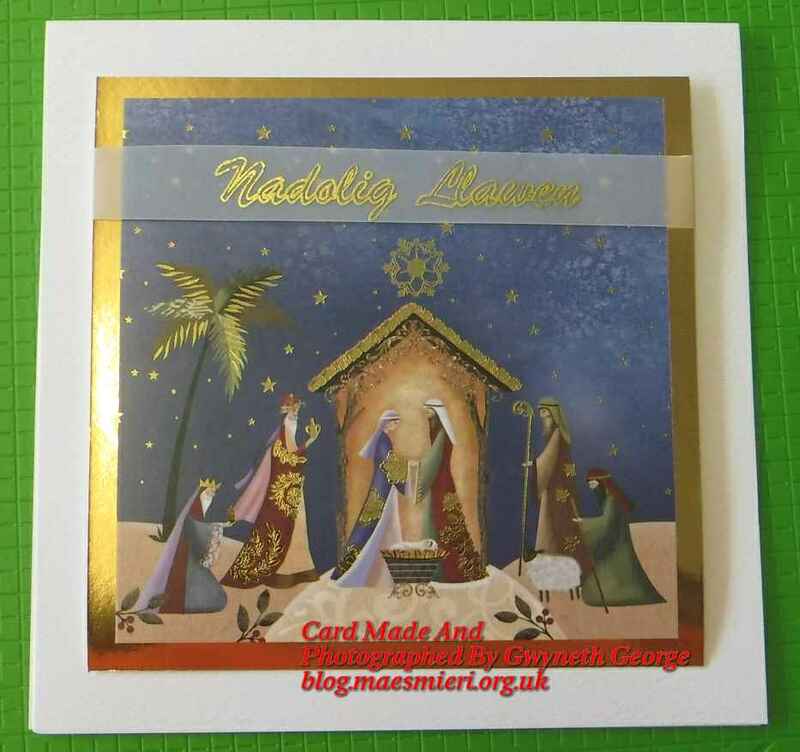 This was simply layered on a 6″ square scalloped edge card. 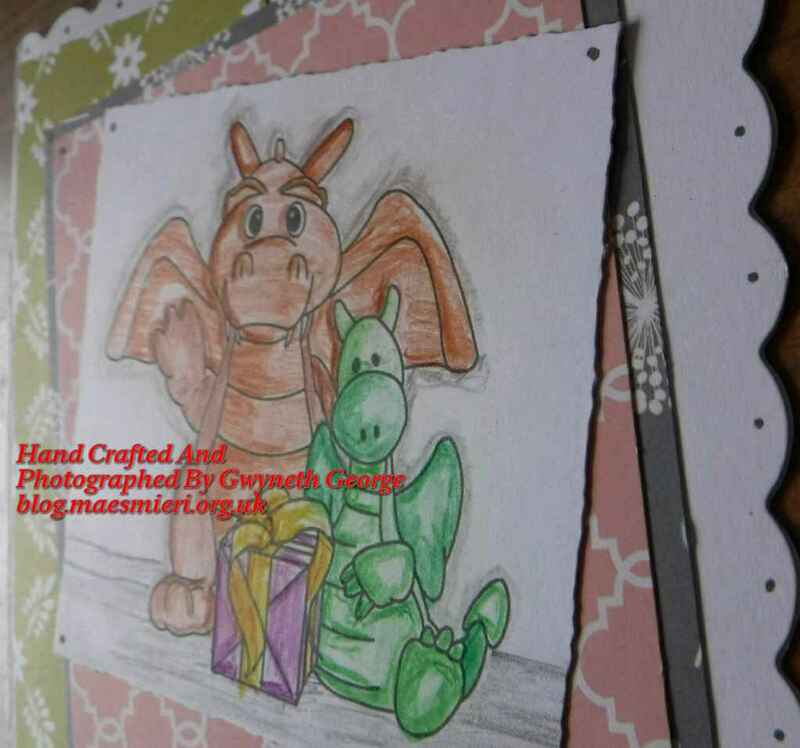 I used a fine liner pen to give some definition to the image area because of not using the base layer. 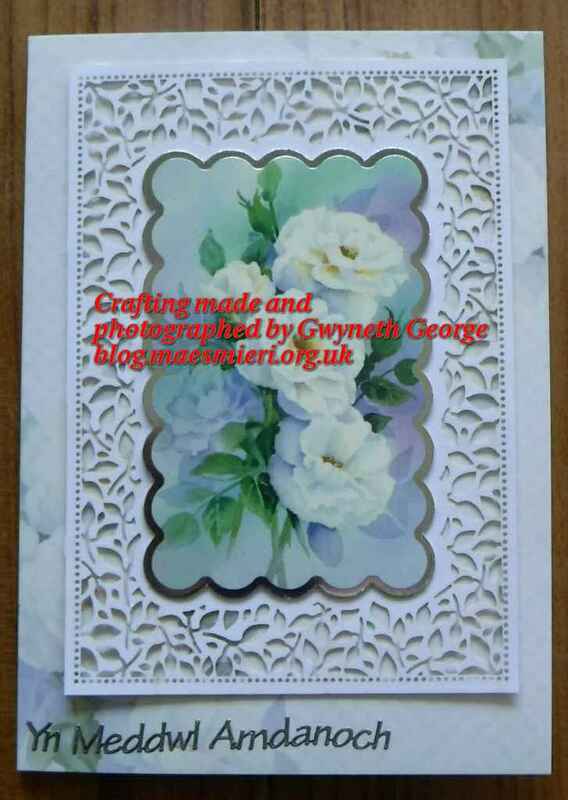 I had another set of decoupage layers from the same Hunkydory collection where the base image and a couple of the layers had been used previously, so I decided to use them up to make the second birthday card. Once again I added some details with a black fineliner pen. 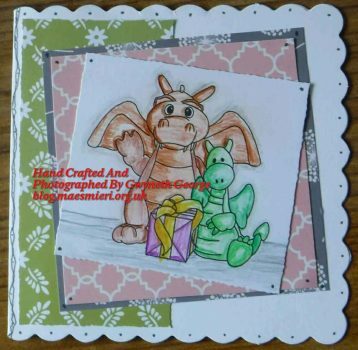 That’s it for today. 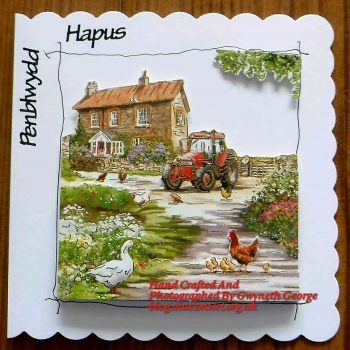 More card making and other crafting before too long, so please do pop in for a look again.